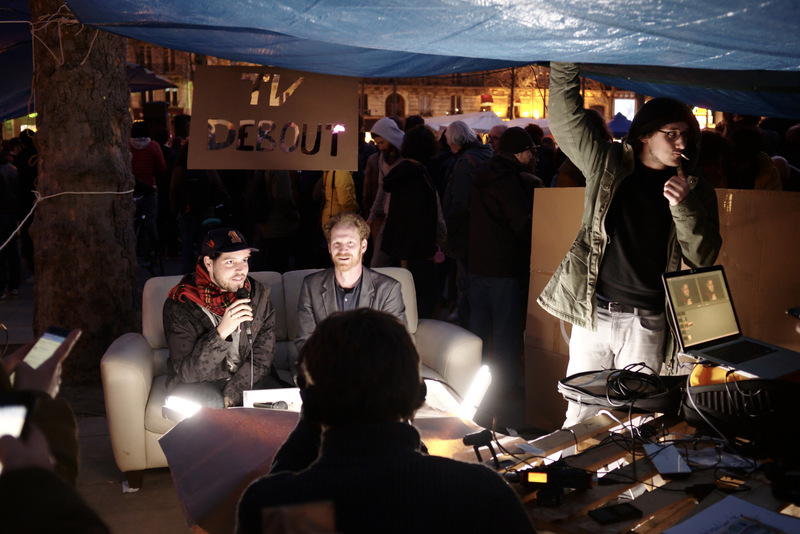 Some call it a phenomenon, others compare it to the failed 2011 Occupy movement, but Nuit Debout has taken the largely discredited French political class, from across the bogus standard left to the far right, by surprise. Sociologically, it should not be a surprise at all. The backdrop is a sense of deep social malaise, a ras le bol et envie de redevenir vivant (a spillover and wish to be alive again). France, as a society, has been morose and depressed for decades, and the state of emergency imposed in a cowardly panicky haste by François Hollande’s administration since November 2015 has turned the country into a pressure cooker. 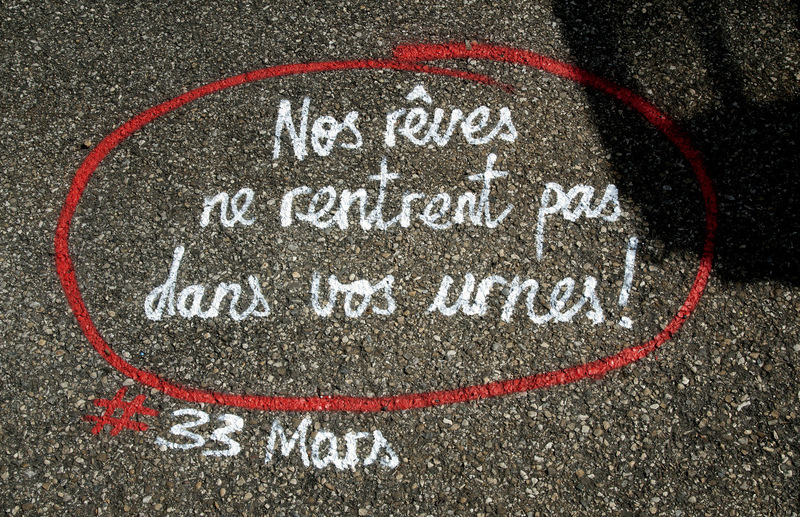 The French political class is reacting with a mixture of understanding for the protesters and threats of a brutal police crackdown on Nuit Debout’s activists. 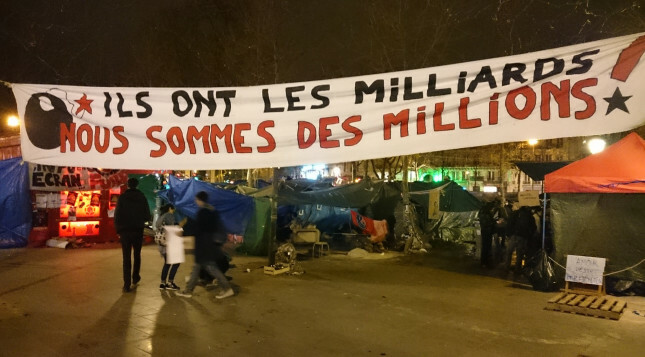 The Socialist Party, more simply identified in France by its acronym PS, is ironically labeled the Parti Scélerat (Scoundrel Party) by the Nuit Debout activists, in reference to the party’s sell out of all leftist ideals. The Mayor of Paris, Anne Hidalgo, personifies the hypocrisy of this ruling party. In a statement to the newspaper Le Monde on April 11, 2016, Mayor Hidalgo did not condemn the movement itself but what she qualified as its excesses: “If it is legitimate to dream of another world, it is not so to degrade this one,” said Hidalgo. She delivered almost immediately on her rhetoric by ordering the evacuation of the Place de la République on the same day. The new and improved French police-state apparatus was eager to execute the order and clear up the square. 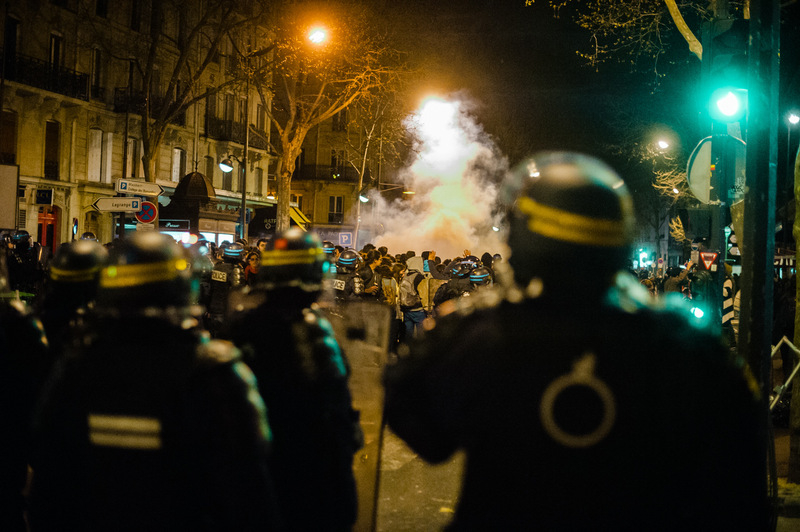 Elsewhere in Paris, five brutal arrests were made, and people were detained without the proper charges, in accordance with the state of emergency’s extraordinary powers, including arrests without probable cause. 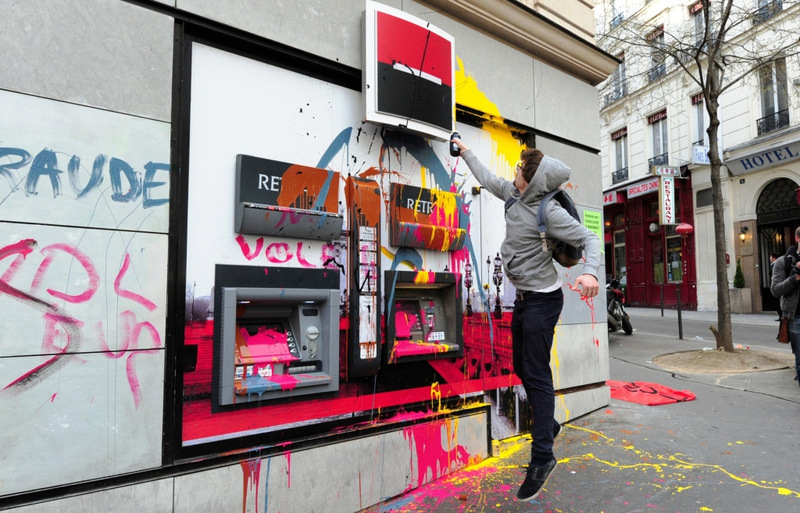 The repression has not stopped the momentum of the movement. 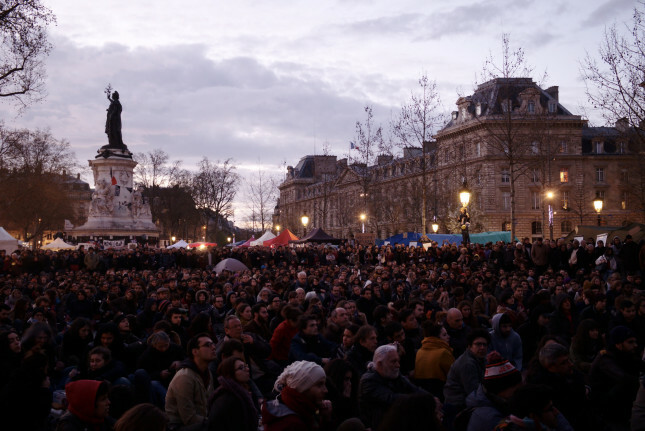 Most of the mainstream media in France and elsewhere are drawing an analogy between Nuit Debout and the Occupy movement of late 2011, as well as the Indignados actions in Spain. This is certainly not a coincidence, considering that Occupy largely fizzled and failed for lack of organization and radicalization, just like the Arab spring in the Middle East was hijacked by the West, under United States leadership, to implement regime change policies through fake revolutions in Libya and Syria. The Occupy movement was infiltrated by informants, neutered and more or less dismantled between early December 2011 and late spring 2012 under the instigation of countless little helpers who were paid to hijack the movement. If the Nuit Debout activists follow the tracks of their predecessors of Occupy, the outcome will be the same. The mainstream analyses do not take into account the fact that France has a revolutionary tradition. The last revolution that bore fruit was in May 1968 and is probably the greatest influence on Nuit Debout. The May 1968 movement started with students and young people, but it quickly expanded to include all the labor unions, which were then very strong. It grew into an open-ended general strike that froze all activities in the country in all sectors of the economy and eventually led to the resignation of President Charles de Gaulle in April 1969 and extensive government reforms. 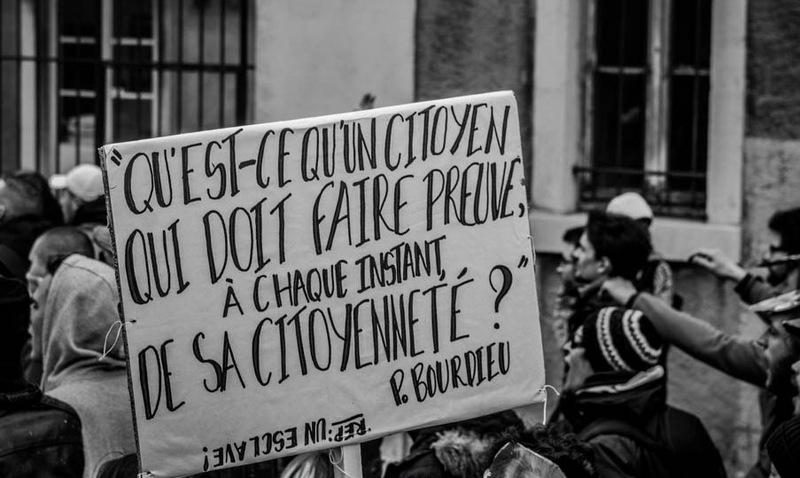 It is May 1968′s humorous and irreverent discourse that we find echoed in Nuit Debout’s slogans today. In 1968, for example, we had “Salaires légers, chars lourds” (Light salaries, heavy tanks), and in 2016 we find “Ils ont des milliards, nous sommes des millions” (They have billions, we are millions). Both movements question the essence of political representation as if all social issues are again up for debate in the public square. 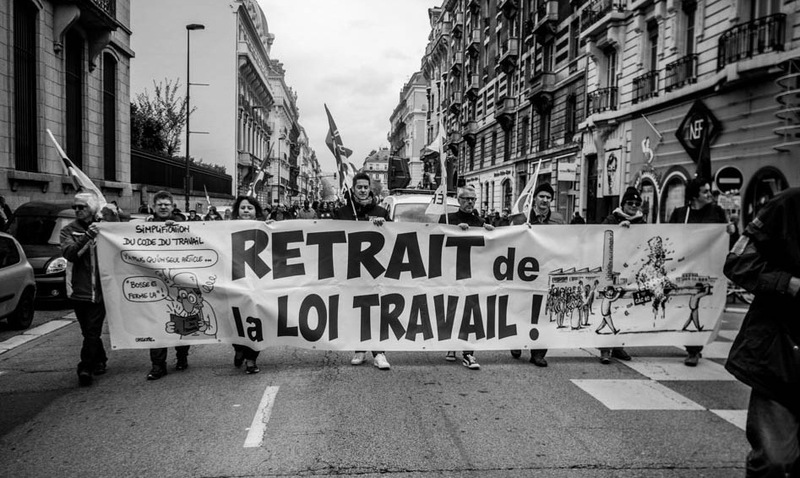 Just as in 1968, the labor unions are quickly stepping in and joining the students, and like the activists of the May 1968 movement, the Nuit Debout activists are hunkering down for what they call une lutte prolongée (a prolonged struggled). Gilbert Mercier is the author of The Orwellian Empire, and Dady Chery is the author of We Have Dared to Be Free. Photographs one and three by Nicolas Vigier; two and five by Titi Photo; six by Georges; and eight by Thierry Ehrmann.